Content marketing has been the most successful method of acquiring users for our startup Process Street. A number of people ask me about my process (no pun) for creating and marketing content that drives users to our product, so I wanted to give the Scoop.it readers the inside scoop (I will stop now). A great content marketing system starts with writing consistent, compelling content. Scoop.it has published some great post on the topic here, here and here. For this post, I will not be talking about how to create content, I will break down the system I used to build our blog to over 100,000 pageviews a month and some of my ideas on how I plan to scale it. We are a small startup, we just finished AngelPad and are raising our seed round at the moment. Because of this we do not have the resources for a large team of content creators and marketers. My team consists entirely of myself and two full time virtual assistants whose salaries are approximately $300/month each. I do all the research and content creation and my two virtual assistants focus 100% on content promotion. When we finish up fund raising I will be scaling this team. I want a full-time editor (to reduce the time it takes me to create and edit posts), a designer (to make my posts pretty and reformat them into slides, ebooks etc) and two more virtual assistants (for promotion). As you may have noticed, I am not planning on taking myself out of this role. Finding great content marketers is really really hard and the posts that do best are ones that draw from personal experience and learnings. Chances are you have more stories that relate to your customers than most of your employees. Because of this I plan to continue writing content for Process Street but systemize it so I can produce high quality content in short periods of time. I will eventually want to hire someone for this role to scale, but I imagine I will still be involved at some level in content creation forever. Freelancers can also be an effective way to scale a content marketing team,something Scoop.it has done very effectively. 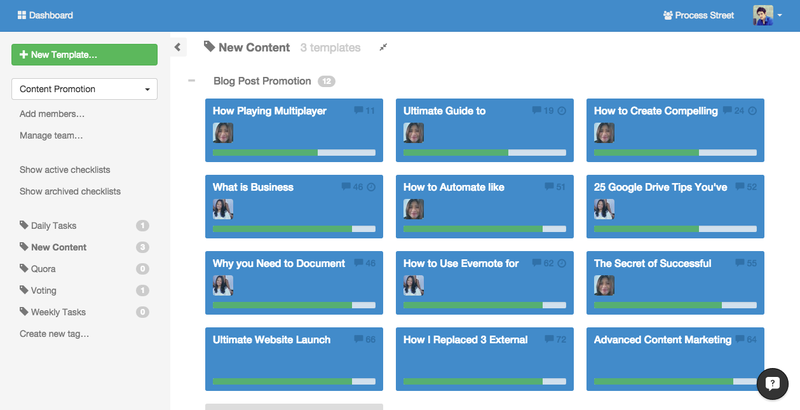 I use Trello to manage and track post ideas, I got this from Buffer who run an awesome blog. I have a huge backlog of ideas for blog posts, enough material to last years. I have this because I am always thinking about content and I regularly add post ideas to our Trello board as I think of them. I do this quickly via the mobile app or chrome extension. If you need some initial inspiration, check out this post from Buffer or use Scoop.it to discover and track great content ideas. I have two main lists, “backlog” and “preferred ideas”. Backlog is where I dump all my ideas, the preferred ones are moved to the preferred list and wait for me to start writing. I add any links or ideas I have for the post as comments on the card so I can access them when I start working on that post. I don’t stick to a strict schedule with my posts, the goal is to do a post every week, but I don’t believe it is worth sacrificing quality to make sure you hit an arbitrary schedule so if I don’t think I have enough time to really dedicate a solid half day to a post, I won’t write one at all. Bringing in an editor will help with this, as I should be able to do 2 posts back to back in that same period and hand them off to the editor to touch up and schedule, essentially doubling my capacity. I move the Trello card down the lists, through “Work in progress”, “Ready to publish” and “Published”. Content promotion is important and is a big piece of the puzzle I see lots of businesses miss. Founders get excited with the idea of starting a blog, but once they get everything set up and start posting, they don’t see any traffic or results and give up. That’s probably because they do not spend enough time, money or effort on actually promoting the content they create. As mentioned above, I have two full time virtual assistants dedicated to promotion. We use Process Street (shameless plug) to manage this process and it works great. I have a template which is a slight modification of this content promotion checklist. Then every time I publish a blog post, I run the checklist and assign it to one of my virtual assistants, they then get to work promoting the post. I can track the status of each post as my assistants work through the tasks promoting them. The thing with promotion, there are high return activities (such as submitting the post to reddit or Hacker News) and lower return ones (such as commenting on other blogs) so we make sure we cover the high return activities on new posts first, then slowly work on the longtail. We are still promoting posts from 6 months ago and we are always promoting dozens of posts in parallel. Ninja tip: We run a similar promotion process on posts on other peoples websites that link back to our product or our posts. This is a great way to build link authority and generate traffic back to your website. So if you link to Process Street or one of our posts, let me know and I will shove a bunch of traffic at the post. And that is the system. Simple yet effective. If you have any other tips, tools or resources on building a content marketing system I would love to hear them in the comments! Editor’s note: for more tips on how to make your content marketing strategy lean as an SMB, download our free ebook.